Forty years after the Naxalbari uprising, it is remarkable that Maoism remains a potent political force. It has survived the disappearance of Maoism in the land of its origin and the collapse of the Soviet bloc. It has survived the retreat of the Left in academia and trade unions, which contributed to the rise of a middle class that was indifferent to politics in general and the Left in particular. It has survived the rise of caste, as opposed to class, politics as well as the growing sway of the ideology of Hindutva. It has survived even the rise of the NGO sector, which, barring exceptions, provided a platform to those who sought to separate ‘social’ work from ‘political’ work. While some Naxals of the 60s and 70s did an about-turn in their political beliefs and practices, the movement seems none the weaker for that reason. True, the far Left landscape is a minefield of splinter groups, but for all their differences these organisations pose a serious threat to state power. Therefore, when one takes stock of 40 years of Naxalism, one should understand it as a phenomenon of the present rather than the past. The ideological underpinnings of Naxalism have not changed. Most parties to the left of CPM still believe in rural armies encircling the cities as the path of revolution. 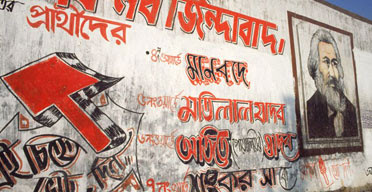 Despite their theoretical allegiance to Marx and Lenin, they have not made any serious effort to organise urban masses, instead evolving over the years as a political organisation of tribals, marginal peasants and Dalits in a corridor of about 150 districts from Bihar to Andhra Pradesh through Chhattisgarh and Orissa. Urban upper middle class ex-Naxals might laugh off the encirclement theory, but to rural cadres exposed to the excesses of urban India after the consumer boom of the 90s the Charu Mazumdar line remains plausible as ever. The fact is that ‘objective conditions’ in certain pockets of the country are no different from what they were in 1967. Those who believe that economic reforms have delivered millions out of poverty should qualify their optimism. Amidst a steady reduction in poverty in the 80s and 90s, defined in terms of calories consumed or expenditures made, there is an alarming prevalence of malnutrition, as indicated by the government’s National Family Health Surveys and NSS data on protein intake. This should lead us to broaden our definition of poverty to include access to healthcare, education and basic consumer goods. Health spending, in particular, contributes to a swift transition from subsistence or even comfortable existence to poverty, pushing families into debt; hence, focusing more on incomes than assets to measure poverty can be misleading. Calorie intake norms should be supplemented by measures of protein and vitamin intake, so that lower calorie consumption is not taken to mean that people have moved on to superior substitutes. A triumphalist media, soaking in the success of India’s economic growth, has missed or chosen to ignore these statistical gaps. Therefore, it is hardly surprising that a section of urban India does not understand the causes of Naxalism. Even if we take the current methodology of poverty estimation at face value and accept that the absolute numbers of the poor have fallen over decades, the statistics, being averages, do not capture the intensity of distress in certain pockets despite high growth in recent years. These are precisely the regions — eastern Uttar Pradesh, Bastar, interior Orissa, parts of West Bengal, Vidarbha — where the influence of Naxalism has increased. To be poor is one thing, and to seem condemned to one’s fate quite another. Rising incomes in post-reform India have created a rapidly growing aspirational class, but they have also contributed to an army of socio-economic orphans — those who have been rejected by all mainstream political parties and adopted by a parallel network of Naxalites, Gandhians and socialists. The ‘problem’ of Naxalism is as much a crisis of political empowerment as it is of sheer economic backwardness. It is hardly surprising that Naxal influence is strongest in tribal India. Tribals, more than any other oppressed category, have got nothing out of the Indian state, before or after globalisation. The Indian state has always taken land alienation of tribals for granted, as one of the consequences of ‘progress’ that must be put up with owing to a skewed pattern of land distribution, tribals and Dalits are at the receiving end of the land- owning castes. In addition, a contractor-politician nexus controls the wealth of the forests and pushes tribals to the margins. A repressive state apparatus, represented by the police and the black laws they use to their advantage, helps keep this exploitative system going. With the opening up of the Indian economy to trade and investment, the entry of mining companies in Orissa and Chhattisgarh poses a threat to the livelihood of tribals and their way of life. Naxalites are among those — though not the only, or even main, political force — who are with the tribals in this context. Even as their adherence to violence cannot be condoned, it is no worse than the violence of the state and oppressive forces in the region. In a sharply unequal society, the line between peaceful and violent politics can turn into a blur. The way out is to address entrenched injustices rather than try to stamp out the responses to it. Should we give this effort another 40 years? This entry was posted on June 17, 2007 at 5:57 am and is filed under Articles. You can follow any responses to this entry through the RSS 2.0 feed. You can leave a response, or trackback from your own site.